euro tour diary: music, cartoons, videos, comics and Ancient Worlds! starting from the end: three new music videos coming up from Brussels! I’m collecting some memorabilia from the recent tour in Germany, France and Belgium… I was lucky to have a very special guest musician in every city, each with a unique different style and I met some very inspiring visual artists and musicians along the road! The tour lasted only 10 days but it was all very intense. In Berlin, Ignatz B joined me at Madame Claude to play the electric blues. Ignatz is from Buenos Aires and he’s one of the bass players on my album. We met at Forte Prenestino in Rome on the first day he arrived in Europe, during Crack! comics festival which I played in 2010 and 2012. Ignatz gets involved in some interesting projects such as experimenting with music for plants in the jungle in Paraguay! 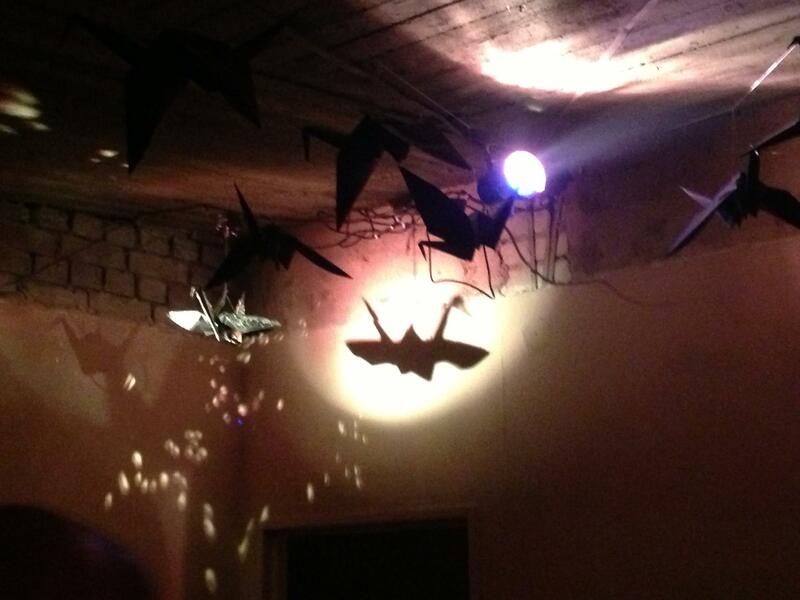 The next night I made a short performance at the Balboa Swing Club in Neukölln. I performed acoustically some tunes from the 1920’s for a dancing audience, some dressed in proper outfits! There I met my friend Jacob, who was telling me about the series of films he worked in Ethiopia together with Vincent Moon: if you are into African music I really recommend watching “GAGAMO” and “THE HARP OF KING DAVID”. My lovely host in Berlin was Judith Sönnicken, who has an upcoming art show in Lisbon, opening on March 14th at Museu Geológico. She’s also preparing a newspaper for SPIES. Judith is a great artist working in different types of media with a lot of humor. Check out her blog! I went for the first time to Hamburg and played at a very neat gallery which just opened nearly a month ago – Kraniche bei den Elbbrücken. The program was perfect together: there was a very cool exhibition by Canadian artist Kalyani Hemphill (here is a sample of what she does), plus a surprise show by Epiphany Now from Berlin and the wonderful sounds of the Magical Flying Love Lab (I include a clip to their music below, under the birds). At this show Felix Kubin joined me with his magical keyboard on the Russian song “Dark Eyes”. Recently I attended his “Futuristic Kitchen Music” workshop in Porto. I’ve been a fan of his music for years since I saw his concert in Porto in 2005 and one of the things I admire in his work is a rare capacity of putting together sounds, performance, film and live visuals in different ways that really blend, adding a lot of cartoony influence! In Paris I arrived in a studio filled with visual artists (a load of comics artists), and saw a lot of imaginary worlds pouring into papers in one room! I was very impressed by the works of Florent Ruppert & Mulot; Maison Chapelle; Kader Benchamma (currently no website but he showed me his fantastic book “Dark Matter”) , Sophie Yanow, Alizée De Pin, Adrien Parlange… and exchanged a cd for “Mambo”, one of the best comic books I’ve seen in years by Claire Braud! At the concert at le Vieux Léon I had Terry Lee Hale joining in some old country classics! Mr. Hale is a singer songwriter from Seattle (he was a booker in the early “Grunge” period and later moved to Europe and went on a solo musical career with a long discography by now) and we had played together before at the One Wo/Man Band Festival in Portugal last year. Opening for the show was Alma Forrer and her band. Alma is a fantastic folk singer, listen to this song ! In Brussels I arrived in the huge maison of an excentric art collector, who has objects in his room going from Ancient Egypt to Tesla-like decorations and surrealistic paintings, Greek and Medieval statues and a bedroom filled with early Catholic art which looks more like a Russian Orthodox church (I swear I’m not making this up). Since all the props were already there, and I had a high-tech photographer (name: Rudy Candillon) and a very creative friend sitting next to me, we shot three music videos and had a lot of fun. Now I need to learn a bit about video editing to put it all together but I’ll get to that soon. There was no gig in Brussels but I met a human jukebox who invited me to play next time at Cinema Nova, which shows a lot of independent film and animation. 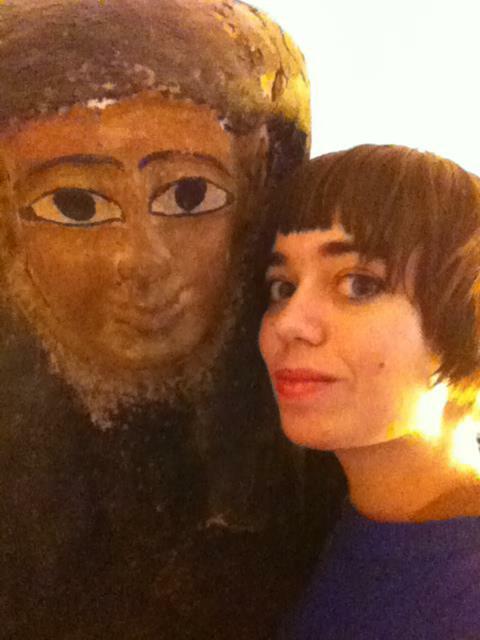 old friend from Ancient Egypt. does he look a bit like a monkey? Talking of Nik Phelps and Annette Hanshaw, have you watched Nina Paley’s “Sita Sings The Blues”? She made the movie FREE. Nina did this award-winning feature animation film all by herself – everything except for the sound, and Nik was one of the film score composers, plus some Indian musicians and old recordings by Annette Hanshaw which appear in a combination of Bollywood with Hindu mithology and 1930’s cartoon setting. Download Sita from archive.org! And check out Nina’s blog with her very cool works, now she’s into sewing Shedu designs on quilts. This entry was posted on February 28, 2013 by Rita Braga. It was filed under animation, collaborations, comics, news, tour dates, videos . readers opportunities to read more. the telephone once you will know all the features of the phone. 65 inches (~ 316 ppi pixel densities) this is being protected with Oleophobic coating.